You know that long belt that snakes around the front of your engine? It’s called the serpentine belt. The serpentine belt is driven by the engine as it turns. It powers your alternator, air conditioning compressor, and power steering pump. On some vehicles it also runs the water pump, radiator fan, and power brakes. Sounds like a lot of important stuff doesn’t it? If your serpentine belt were to break on one of our Englewood Florida roads, your battery would die in a few miles. If it runs your fan or water pump, your engine could overheat. And steering and braking could be more difficult. Obviously, the best thing is to replace your serpentine belt before it breaks. 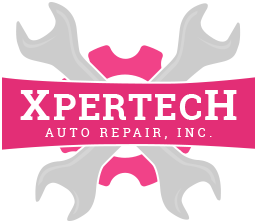 Check your owner’s manual for when factory maintenance is recommended for you belts and hoses, and/or the interval recommended to replace your serpentine belt – or just ask your Xpertech service advisor for assistance. They can inspect the belt as well to see if it’s in trouble. You may have been told by a service advisor in the Englewood area to look for cracks in your belt to see if it needs to be replaced. Of course, cracking is still a concern, but modern belt material doesn’t crack as often as old belts did. What we look for these days is the thickness of the belt. We have a special little tool at Xpertech that measures the depth of the grooves in the belt to see if it needs replacing. Now you can imagine it’s important for the belt to be tight, so there’s a tensioner pulley on your engine that puts pressure on the belt to keep it at the right tension. The spring on the tensioner wears out over time so we recommend replacing the tensioner pulley at the same time as the serpentine belt.